I’m always trying to master new cooking techniques. Like any proper foodie, understanding how a dish works kinda makes my heart beat faster. Oh, the excitement of getting a bechamel sauce just the right consistency or making a smokey babaganoush (and filling the entire flat with smoke) – it’s pure joy! One of the must-learn dishes that’s been on my list for ages is an île flottante – a floating island. I realised by talking to my English friends that this classic French dessert is pretty much unheard of in Britain. I had to explain to most people what it is: a yummy vanilla custard topped with a fluffy, feather light meringue. Traditionally, it’s all topped off with a few dashes of caramel. It’s amazing. For me vanilla-lover, it’s really the perfect dessert. The best île flottante is one with home-made custard. Forget the store-bought one, this dessert screams for freshly made custard, with bright-orange egg yolks that bestow it with a healthy yellow colour. Plus, a floating island is a very clever dish: you use the egg yolks for the custard and the remaining egg whites for the meringe. No waste here, non non! But be warned: making custard is not that easy! In fact, I’d made it before but still managed to burn mine this time and make the egg curdle. Disaster! So, please remember to be super gentle with the heat – don’t rush your custard by making the bain marie boil! Your water needs to constantly be steaming hot, but NOT boiling. Unless you like your custard curdled.. yuck! Don’t be put off by that though – I look at it as a challenge, a fun one, with a very tasty reward in the end. Now, the only downside with this dessert is that it’s pretty eggy. That’s not a problem as such, were it not for the fact that after a few spoonfuls you feel quite full, or egged out. 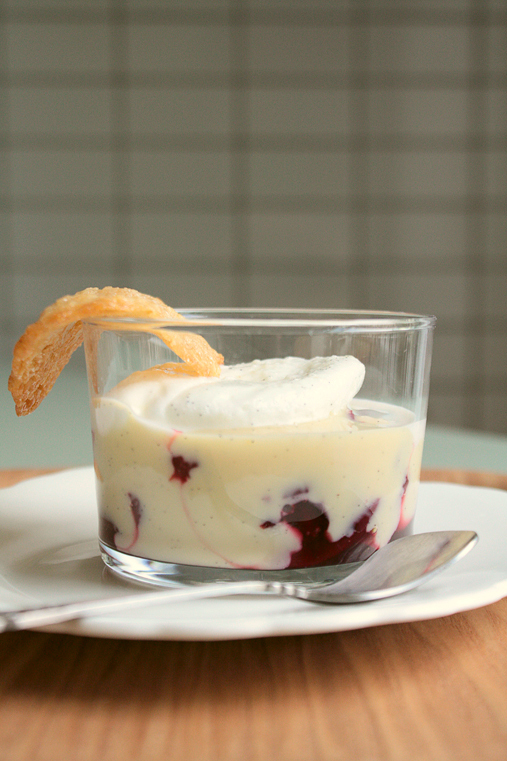 So, I came up with the idea of pairing the floating island with some cherry compote – adding a bit of tanginess and freshness to an otherwise extremely sweet and creamy dish. Start by making the compote: wash your cherries, cut each cherry in half and take out the stone. Put all your cherries into a saucepan, add the sugar, lemon juice and rum and cook over a medium heat until the fruit has softened but hasn’t fallen apart yet. Take off the heat and let the compote cool down. For the custard: make a bain marie by putting boiling water into a big saucepan, then put a second, smaller saucepan into the hot water. Keep the water hot (but not boiling) on a low heat. Cut open the vanilla bean, remove the seeds. Gently whisk the egg yolks, sugar, cornflour and milk together in the small saucepan, add the vanilla seeds and the vanilla pod into the custard mix. Constantly stir the custard for about 10-15 minutes until the mix thickens and resembles a custard. (Make sure the water is hot but not boiling, otherwise your custard will curdle and you can start from scratch again). Take the small saucepan out of the water and cover the custard surface with cling film (so that no skin forms) and let completely cool down. For the meringues: Whisk the egg whiteswith an electric hand whisk until soft peaks form. Slowly add the sugar and vanilla essence, whisking constantly until glossy and stiff. Heat the milk in a saucepan until hot but not boiling. Using two tablespoons, spoon 4 meringues, one at a time, into the milk and gently poach, without moving them for 4 minutes. They will grow bigger, so keep an eye on them so that they don’t “explode”. Remove with a slotted spoon and set aside. Melt the butter in a bowl in the microwave. Once melted, add the honey and mix well. Then stir in the sugar, flour and oats. Cover the bowl and leave to cool in the fridge for 1 hour. Preheat the oven to 180° celsius. Line a baking tray with baking paper. Put teaspoon-fuls of the mixture onto the baking paper, leaving enough space between each little ball, since they’ll spread out. Slightly flatten the balls with the back of your spoon. Bake in the preheated oven for 6 mins or until golden brown. Take then out and leave the tuiles to cool down for a couple of minutes before transferring on a wire rack. Once they’re a bit cool (after about 1 – 1 1/2 minutes), transfer them on a wire rack, or if you want them to be slightly curved, onto a rolling pin/thin round glass. Once they’re completely cool, they will hold their shape. You can store these tuiles for a couple of days in a tin, but they will become more chewy and lose their curvey shape, so, they’re best eaten on the day. Lovely twist on the old “île flottante”. 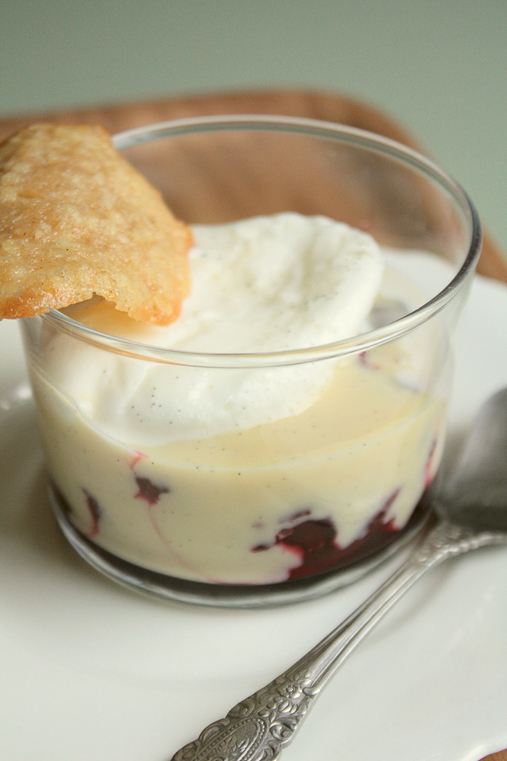 We loved the combination with the cherry and the tuile.